CHAMPAIGN, Ill. (AP) — Only a few weeks ago, mentioning a possible bowl bid in the same sentence as Illinois might have earned more than a few chuckles. What a difference a few wins can make. Purdue visits Illinois on Saturday in a game that has implications for the postseason hopes of both teams. The Illini (3-2, 1-1 Big Ten) need only three wins for eligibility, And with games against Maryland, Minnesota, Nebraska, and Northwestern looming, a win would give Illinois a legitimate shot. Purdue (2-3, 1-1) has a tougher road to make its second bowl in a row after three close losses this year. The Boilermakers need to beat Illinois, Indiana, Minnesota and Iowa to have a realistic chance. Illinois coach Lovie Smith is counting on his aggressive ground game against Purdue, and for the rest of the season. Quarterback AJ Bush, who returned against Rutgers after missing three games due to a hamstring injury, is healthy and mobile as ever. The dual-threat senior rushed for 116 yards in the win against Rutgers, and joins running backs Mike Epstein and Reggie Corbin as major concerns for the Boilermaker defense. Purdue quarterback David Blough is expected to make his 30th career start, tying two-time Super Bowl winner Bob Griese for eighth most by a Boilermakers quarterback since 1960. Blough would be higher had he reclaimed the starting job out of preseason camp or if he hadn’t had last season cut short by a dislocated right ankle. Running back D.J. Knox and receiver Rondale Moore have given the Boilermakers’ offense a strong scoring punch. Knox, a fifth-year senior, and Moore, a true freshman, have combined for 10 of Purdue’s 18 touchdowns, 62 percent of the team’s yards rushing and 30 percent of yards receiving. Not enough? They’ve also combined to pick up 40 percent of Purdue’s non-penalty first downs. Both are capable of making big plays at any time. For the fifth straight year, Illinois will honor Harold “Red” Grange,” the Galloping Ghost, by wearing special “Gray Ghost” alternate uniforms for homecoming Saturday. The uniforms debuted in 2014 on the 90th anniversary of Grange’s historic homecoming performance against Michigan in the Memorial Stadium dedication game on Oct. 18, 1924. 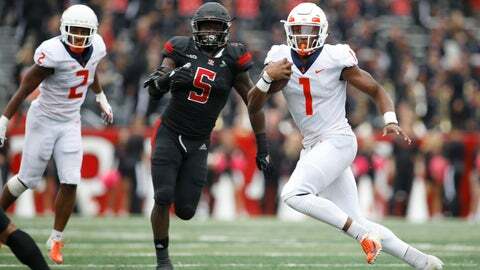 In that game, Grange scored four touchdowns and racked up 262 total yards in the first 12 minutes, then ran for a fifth touchdown and threw for a sixth to lead the Illini to a 39-14 victory.